Tree pruning is an important part of that process to protect and maintain the health of your trees. Surprisingly enough it is a task that is let go all too often by homeowners. It is something that really needs to be done on a regular basis and it’s so important because it affects the health of the other shrubs, flowers and plants in your landscape too. The folks at Sanford Tree Service have some of the best tree pruning in Sanford, FL and know exactly how to prune your trees for maximum benefit. Maybe you have taken a walk and noticed two houses whose landscapes look completely different. Maybe one has unhealthy and unkempt trees while the other has trees that are nicely trimmed and pruned and look great. Proper tree trimming really does make your landscape stand out that much. Our tree pruners can work their magic and get the trees at your home or place of business looking magnificent. Aesthetics – We have already mentioned how much better trees that are properly trimmed and pruned look as opposed to those that are left unkempt and unhealthy. Many homeowners try to undertake the task of pruning their trees themselves. This is not advisable for the simple fact that improper tree pruning can harm or even kill the trees that it is performed on. Sanford Tree Service only employs highly skilled personnel that are very adept at Sanford tree pruning and providing other tree related services too. They will know exactly where to trim and where to cut so your trees not only look great but are healthier overall too. 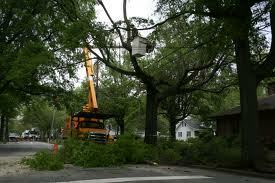 Sanford Tree Service also believes in doing their tree service work at a fair and competitive price. We are always more than happy to come out to your home or place of business to give you a completely free estimate for your tree service work. In addition to tree trimming and pruning we can also handle complete tree removal, large limb removal, land clearing and many other tree related services. So call Sanford Tree Service today at 407-871-6001 for a free estimate. We service all major communities in Sanford and the surrounding area.